COTTON BRAIDED WIRE AND PARTS. 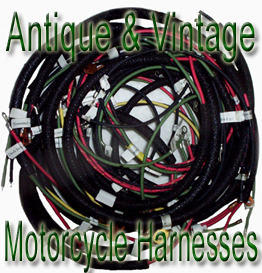 antique and vintage motorcycles,scooters etc. Give our services a try and hope you find it to be a pleasant experience purchasing from us. We also sell our parts and work with many catalog companies and shops producing one off rare and unique items should you have an interest. Special braiding work also available. This sale is for One Henderson K-427 horn switch. Spring steel lever. Bakelite thumb button. Nickle finish.